Personalize it with a defining phrase or motto, or the name of someone special. Whether you personalize it with a defining phrase or motto, or the name of someone special, this modern necklace is a stylish way to keep what means the most to you close. It's cast to give each letter a three-dimensional feel, letting you reinvent the "statement" piece in subtle, everyday style. Made from gold-plate and sterling silver in Erlanger, Kentucky. Got a lot to say? That's okay! 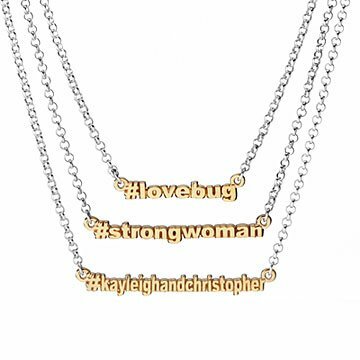 Just please note that after 12 characters, the text is narrowed to keep the necklace a wearable size. As Sterling Silver is exposed to pollutants in the air, it becomes tarnished and loses its luster. This is a result of the oxidation of metal. By following a few guidelines, caring for your Sterling Silver is relatively simple, and will add to its beauty and personal value. 1: When not wearing your Sterling Silver jewelry, place your jewelry in the packaging supplied to store them. 2: Put your jewelry on last. Exposing your jewelry to hair spray, cosmetics and perfumes can cause spots. 3: Jewelry should be removed before swimming (chlorine), showering, dishwashing, handling bleaches, alcohols or cleaners. 4: For safety reasons, and to minimize scratching, jewelry should also be removed when doing yard work, cleaning or sports activities.